Scores of Migrants Found Dead in a Truck in Austria. Why Is Anyone Surprised? 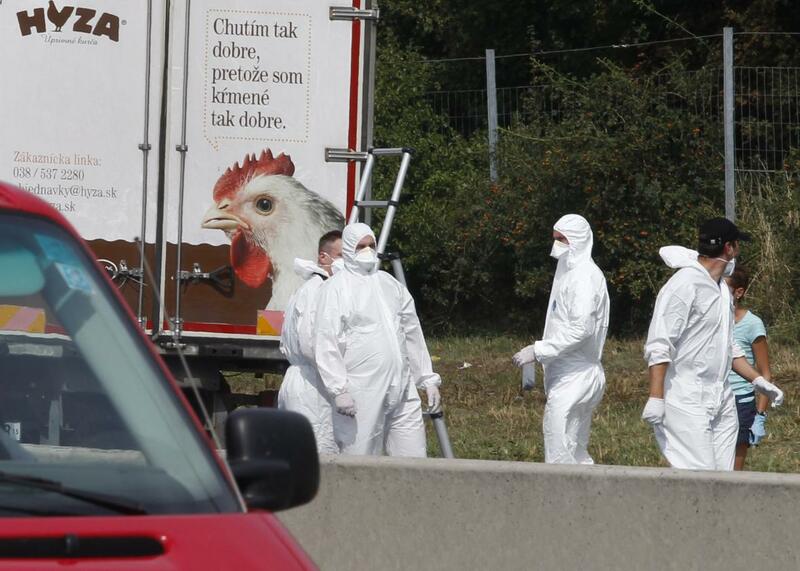 Forensic officers work at a truck inside which were found a large number of dead migrants on a motorway near Neusiedl am See, Austria, on August 27, 2015. As many as 50 people, believed to be migrants, were found dead on Thursday in a truck on the side of a highway in Austria near the Hungarian border. Grim and tragic as the incident is, it’s a little strange to see the amount of attention it has received given how depressingly common such tragedies have become. It’s only been three weeks since around 200 migrants were killed when their overcrowded boat capsized, deaths that got far less attention, perhaps because they were among the more than 2,000 who have died in similar incidents on the Mediterranean this year. I suspect that the reason media outlets have given more attention to today’s tragedy is that it took place in Central Europe, as the Mediterranean and even Turkey and the Southern Balkans have come to be viewed by citizens of developed countries as an anarchic frontier between Europe and the chaos of North Africa and the Middle East. But when this kind of tragedy happens on a roadside in the heart of Europe, we notice. The tragedy in Austria comes as diplomats from throughout the continent are gathering in Vienna to come up with an action plan following a month, July, in which the number of migrants pouring into Europe exceeded 100,000 for the first time. Under regulations adopted in 2013, asylum seekers entering Europe must remain in the countries where they enter. But Greece, Italy, the Balkan countries, and more recently Hungary, where most of the recent arrivals have entered, have been calling for a continent-wide solution to the problem and accused their northern counterparts—the desired destination point for most of the migrants—of leaving them to deal with the crisis. Meanwhile, Germany, the place where the highest number of refugees hope to end up, is calling for mandatory quotas for refugees throughout the EU, something other government have fiercely resisted. While the politicians squabble, the consequences of the crisis are getting harder for northern and central European countries to ignore. Germany has seen recent a wave of far-right attacks on refugees, including firebombing of refugee centers. While Chancellor Angela Merkel has not always distinguished herself with her sensitivity on this issue, she’s strongly condemned the attacks and the rhetoric behind them, becoming the unlikely subject of mash notes from Syrian social media users. Meanwhile, authorities in Calais, France, have been overwhelmed by a recent influx of refugees seeking to cross into Britain through the Channel tunnel. Net migration to Britain is also at an all-time high, one factor driving support for the campaign for the country to leave the EU entirely. While the migrant crisis is driven by events outside the direct control of European governments, it’s been clear for quite some time that a continent-wide strategy is needed to respond to it—a point that shouldn’t have required today’s tragedy to drive home.